If you like Taco Bell’s potatoes this recipe is a MUST try! In my opinion, this is VERY close to those potatoes you find in their Potato Grillers, fiesta potatoes, and Cheesy Potato Burrito’s. Making a batch can give you the opportunity to make these different ways! These Taco Bell Style Potatoes are prepared and tossed in an easily made coating. They can probably be frozen since there are many “freezer potato entrees” at the grocery store that can be heated at home. Try making a cheesy potato side or burritos or perhaps just dipping in a favored sauce? This recipe is versatile! 2. Remove potatoes from pot and slice into 1-inch slices lengthwise then dice into chunks. Toss with olive oil. 5. To re-heat cold potatoes or use in burritos; bake at 400 degrees F for 8-10 minutes or until sizzling. Taco Bell Potatoes can now be replicated from your kitchen! 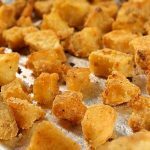 These Seasoned potatoes are prepared and tossed in an easily made coating and baked to Taco Bell Style Potatoes! Remove potatoes from pot and slice into 1-inch slices lengthwise then dice into chunks. Toss with olive oil. Bake at 425 degrees F for 25-35 min. To re-heat cold potatoes or use in burritos; bake at 400 degrees F for 8-10 minutes or until sizzling. Thank you Alyona for such an easy but absolutely delicious potato recipe … mine turned out great! oh, awesome Tamara thanks for the feedback! I was craving these so much during my last pregnancy, lol. I will try making thus recipe. Thanks for sharing!